Two roller coaster cars collided today at the Alton Towers amusement park just outside of London, in a terrifying realization of everyone's biggest theme park nightmare. 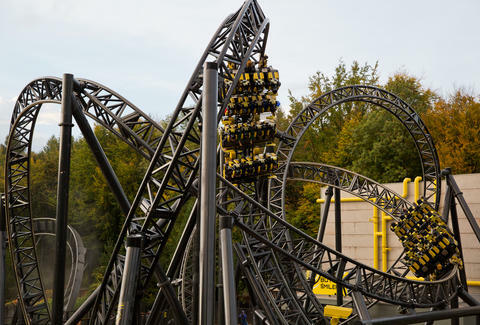 The incident occurred on a popular coaster called The Smiler, when a car packed with 16 passengers struck the rear of a second, empty car at roughly 50mph. According to eyewitness accounts, the ride was still in operation despite having been closed down earlier in the day due to technical problems, and both the occupied and empty cars had been held stationary before being seemingly switched back on and colliding with one another. Four of the passengers sustained serious injuries in the collision, and were evacuated to a local hospital via air ambulance shortly after they were removed from the ride. Despite holding the world record for most inversions on a single ride, The Smiler's actually been shut down twice before due to technical/mechanical problems since it opened in 2013. Hopefully this'll be the final nail in the coaster's coffin, and a newer, safer coaster can claim the inversion record.